Good morning, lovelies! For those of you who spent the last week adjusting from Spring Break to the work week or school, I am just as sad as you are. Except, maybe I've already had my morning coffee and you have not. But on the plus side, I'm the only one I've seen at school so far who has returned with a tan AND it is warm enough to wear my FAVORITE open-toed wedges. So there could be worse ways for break to end. 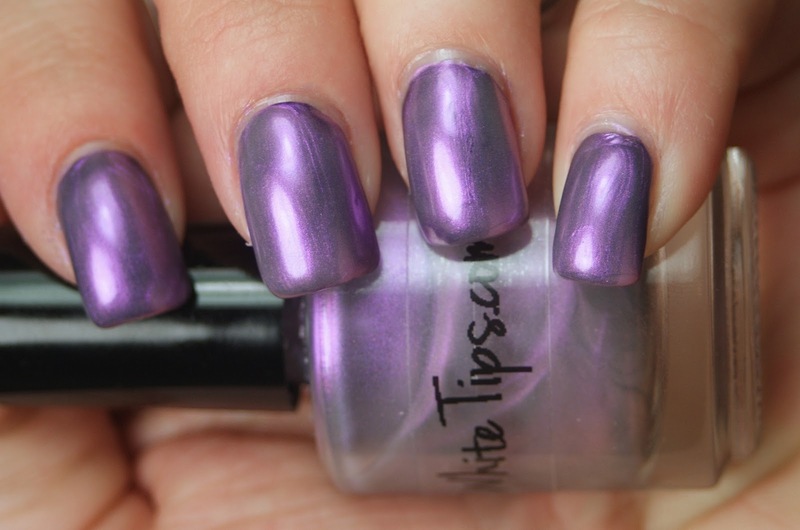 Today, I'm bringing you a polish sent to me by Laura of Ruby White Tips. Girl must know me well because she sent me them in my favorite color: purple! Also, read on for an exclusive discount code just for readers of Princess Polish! Here is Gracelyn, a magenta foil duochrome with some hidden blue sparkles. With two coats, it is very pretty and unique on its own. An AWESOME color for spring and summer. Here is one coat of Gracelyn over one coat of Rimmel Black Satin. This looks amazing. It has beautiful sparkle to it that is so apparent. The great thing about Gracelyn's performance as a top coat is that this can be a go-to color 365 days of the year. This is the perfect fall or winter look. You can REALLY see the gold here! Gracelyn was actually developed by Laura's eight-year-old daughter, who is the namesake of this polish. I think she did an awesome job! The formula was great and applied like a dream, with two coats of Gracelyn required for opacity. And it's a very versatile color, too. Gracelyn is available in the Ruby White Tips Etsy store, along with a large variety of other amazing colors! It is $8.50 for a full-sized, .45 oz bottle. It's vegan and 3-free, to boot! So what do you think of Gracelyn?